Time to sell your Driftwood Towers condo? Read about today's resort-market condo buyer. 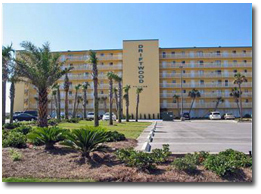 Driftwood Towers condominium complex is located one-half mile west of Highway 59 in Gulf Shores, Alabama. This seven-story, 49-unit, gulf-front complex was built in 1983. The building consists entirely of two-bedroom/two-bathroom units that offer 970 square feet of space. Each of the units offers a larger and wider than normal floor plan for an older complex. This complex offers a great location within walking distance to many popular restaurants, such as Bahama Bob's and Desoto's. Come and enjoy a great beach vacation home that offers plenty of activities on the beach, in the surf, or just lounging around the large outdoor pool. This building is very well maintained. Units are quite affordable and would make an excellent vacation home or rental property. Similar condominiums near Driftwood Towers include Island Winds, Ocean House, Island Shores, and Island Sunrise. Discover more Gulf Shores or Orange Beach condos for sale by using our interactive maps, aerial imagery guides, or click on one of the pre-defined search links on the right navigation bar such "gulf front condos", "lagoon front condos, or "golf course condos". Please let us know if you would like further info for Driftwood Towers or any other Gulf Shores condos, homes, or real estate along the Gulf Coast or would like to schedule a private viewing by emailing info@condoinvestment.com or by calling 251-Area-Pro (251-273-2776) for immediate assistance. Visit our Alabama Gulf Coast Condo Revenues pages to find annual rental incomes for Driftwood Tower and other Gulf Shores condos.